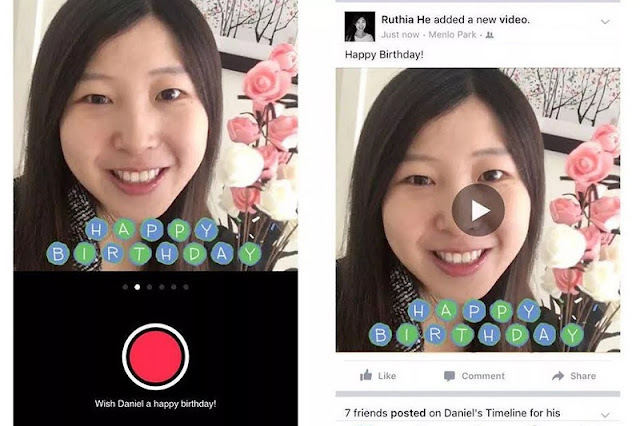 Facebook is pushing like crazy for video content, and now it comes up with a very nice way to nudge you into it, with Happy Birthday video messages. Social networks have made sure not a single day goes by without a notification that it's some friends anniversary; but that has lead to the "automatic birthday message" syndrome, where people just quickly tap to send a generic happy birthday message and not taking the time to actually congratulate them. That's something Facebook hopes to change using short video messages. It's no secret that Facebook hopes that people use more and more video messages in the future. And this is just one more indication of that. Instead of using a preset message, this Happy Birthday cam wants you to record a short (up to 15 seconds) happy birthday message for a friend - that will, at the very least, let them know you took the time to do it (instead of quickly tapping on a preset message or dismissing it entirely). For now this Happy Birthday cam is available only on Facebook's iOS app, but it shouldn't take long for the Android version to get it as well.